MSF teams mobilised on 30 March to support the Gazan health authorities treat people injured in protests at the fence that separates the blockaded enclave from Israel. 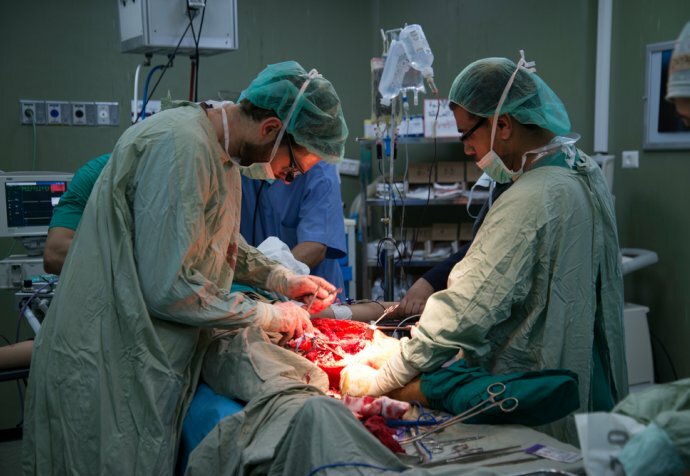 Michel Sauer, a French vascular surgeon, is currently in Gaza. “On 30 March we were in Nasser hospital. In the ward where I was we received three young people shot in the abdomen, and two shot in the head. I assisted local surgeons in two operations," explained Dr Michel Sauer. "The first was really a bad case, the bullet had torn a hole in both the main artery and the main vein in the chest. Arteries are not so difficult to repair because they are quite thick, but veins are much thinner and much more fragile. It is very easy to do more damage when trying to sew them up. In the end we succeeded, but the patient had lost all his blood – he required a complete transfusion. Mohammed Abu Jasser, a nurse from Gaza, was assisting Michel. He also worked during the worst days of the protests last year, when hundreds of people were shot in just a few short hours.